I often make roasted chicken and, since there’s only two of us in the house, can make it last for three meals — roasted chicken, chicken salad — and the finale being a chicken soup made from the homemade stock (a good recipe from New York Times). 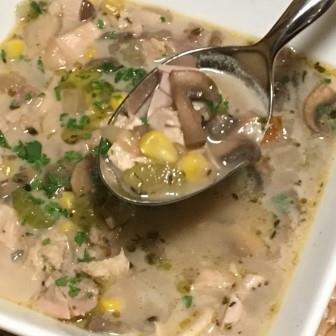 This recipe for mushroom, chicken, corn chowder came out of one of these easy dinner weeks. My super easy soup recipe takes about 15-20 minutes to put together and about 15 minutes to simmer. Serve with a green salad dressed in Garlicky Lemon Vinaigrette and a light, unoaked Chardonnay. Tip: If you like your chowder a bit thicker, you can sprinkle in 1 Tablespoon flour when you add in the mushrooms. 1. Heat olive oil in a dutch oven or large saucepan over medium high heat until glistening. Add garlic and saute for 1 minute. Add onion and celery and saute an additional 4 minutes or until onions look translucent. 2. Add mushrooms, thyme, oregano, corn, pepper and salt. Stir 1 minute then pour in the chicken stock. Bring to a boil, then reduce heat and simmer 10 minutes. 3. Add chicken, chipotle power, dry sherry, and coconut milk. Simmer an additional 5 minutes. Taste for salt and adjust as necessary. If you have the time, you can simmer longer… it gets better with time and makes super tasty leftovers.